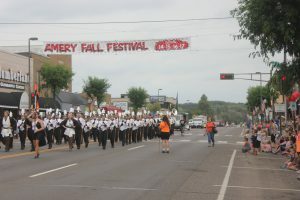 Amery Fall Festival, a success on a beautiful day, enjoyed by 1000s. The annual Fall Festival today, the 16th day of September. Lovely day, hinting of rain last night but it didn’t materialize. Warm, even hot at times, and breezy which felt pretty good but blew items around. The lineup began around 9 or 9:30 on the north end of Amery, up the side streets and back to North Park. Highway 46 was diverted for the time the parade took to get done, and by that time the food stands and rides area was going steady and heavy. Lots of browsing in the large crafts section, but didn’t see a lot of buying. Many meet-ups of old friends and relatives in that area. Walked to the food section and it was packed. I’m getting ahead of myself. The parade. Starting promptly at 10:30 after MC Bill Hegg arranged and got the Queen and her Princesses from last year to sing the national anthem. Lots of pride, and soon the festivities began. Candy right off the bat, and the parade of fire and emergency equipment took awhile to move through. Besides Amery the truck from Osceola, Apple River Township, and Clear Lake became part of the entourage. The variety of Amery emergency vehicles included their newly acquired air boat, able to move quickly through water and I’m guessing over ice and thin ice. 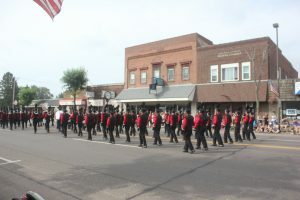 The Amery Band did a nice job, the Clear Lake and cadet band did well also. From Elk Mound, their band put on quite a show. Lots of members, lots of intro people at the beginning with flags and the city/ school banner, and 3 characters dressed, well it was a Star Wars theme so the music reflected that. 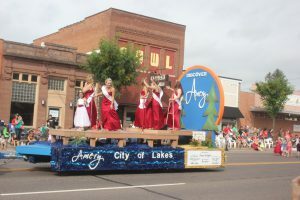 Queen candidates from Amery appeared one at a time, but the queens and their support group from the Polk County Fair, Clear Lake, and other communities added color and beauty. Hudson was another one I just recalled. So then the tractors captured everyone’s attention, mostly Allis Chalmers but many others as well. Al Johnson is the main man in this area, his tractors are featured and I’m guessing so are others. No women, except toward the end a lady was on the little Ford tractor that was so common, often used only for wagon pulling or single bottom plowing. The Cub and Boy Scouts marched proudly, not a lot of business floats or trucks that I remember, and a few other random entries. The Zor Funsters were the big men on go-carts, wheeling around in intricate patterns, and they would calm down and get into formation. Then, wham, they’d move in their weaving and quick movements. They appeared to enjoy it as much as the crowds did. The viewers weren’t that thick along Keller near the downtown, but next to and across from the announcing wagon featuring a sincere Bill Hegg, at those points the people were two and three deep. The chairs started appearing near the old railroad tracks are, appeared on Thursday or before. The announcements from Bill helped understand what group moved through and his words made the people involved in that float or band or entry, it made them feel appreciated. A welcome to the Fall Festival Parade and a “glad you’re here”. The end of the parade was the horse group, not sure how many, but they were often the last in the past. And the poor looking man with the scoop shovel and the wheelbarrow, what a job. No, really, he didn’t look so sad. He knew there was a job to do and he was going to do it. Besides, maybe he got down to the end of the parade near the hotel and onto old Soldiers Field and he put a price tag on it, $5, you haul. As stated above, dozens of craft choices, a few wood products, some cosmetics and food items, and all were under a tent of some sort. That would mostly hold out the rain, but on this day they were shade, welcome shade. The rides were just south of the craft area, but I didn’t get into it. Lots of good sized rides, and a few food stands I’m guessing. They set up last Wednesday I believe and were operating by Thursday evening and for sure on Friday eve. In the food section, a number of groups including Scouts, the Wrestling Club, the Hockey organization and parents, several churches, the Lions, and the bleu cheese burgers at the Joel Homemakers stand. This year I broke down and had two of them, but nothing else in that area. This year I have to proudly declare that I did not buy any little doughnuts, often a delicacy that I associate with fairs and times like this. The Fall Festival food choices offered something for every taste. I think you summed up Fall Festival very well. I guess you didn’t take in the crowning of the queen. That used to be my favorite part of the festival in years past. That and the rides. As a kid I used to enter veggies I grew in our garden to see if I could win a ribbon. It seems like I always won a ribbon for my eggplants and that’s probably because no one else grew them. I also would show my art work in the small gym in the high school, which later was part of the middle school. What great memories. Fall Festival continues to make great memories every year I attend. This year is no exception. Thanks Terrie, I’ve got a few memories also. Fun to think of them and how the joy of them changed over the years as we get older. I also liked it when it could center around the high school and both gyms. The eggplant experience is funny. Got home about 7:30 tonight. Funny to get back to normal, as it will be for you this week, I’m guessing. The poop scooper comment made me smile. Many years ago we had a horse drawn surry with a fringe on top in the FF parade. Even did the victorian costumes and Chuck played his accordion as i reined the single horse. We were asked to provide our own cleanup crew and i believe we had the first official Poop Squad costumed and labeled as such. With the Poop Squad, all boys from Deer Park, and just the single horse we were allowed to go somewhere in the middle of the parade rather than at the end with the saddle clubs. Remembering the age of the kids I’m thinking that was in the early 80s. Fun stuff. Hi, Yvonne. I think I remember that. One time the poop scooper kid looked terribly depressed, but not sure if it was the one you referred to. Yes, this year was hot but not unbearably, kind of like a warm July day; the next day it dropped about 20 or more degrees. Yes, good to have the horses mid-parade. At the end, people are looking but also packing up to walk to their cars and they miss the horsemanship. Did you get your shed finished? Thanks for writing, Yvonne.